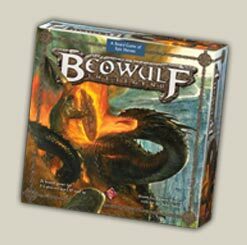 Beowulf is a game about risks. In many ways it can be said to treat the source material in a fairly abstract manner (e.g. not a lot of miniatures and thematic cards), but the way you can risk taking scratches/wounds in order to increase your chances of staying in a bidding feels very thematic to me. I also really like how they handle scaling the game to 3-5 players without affecting the difficulty (by limiting the number of available options).